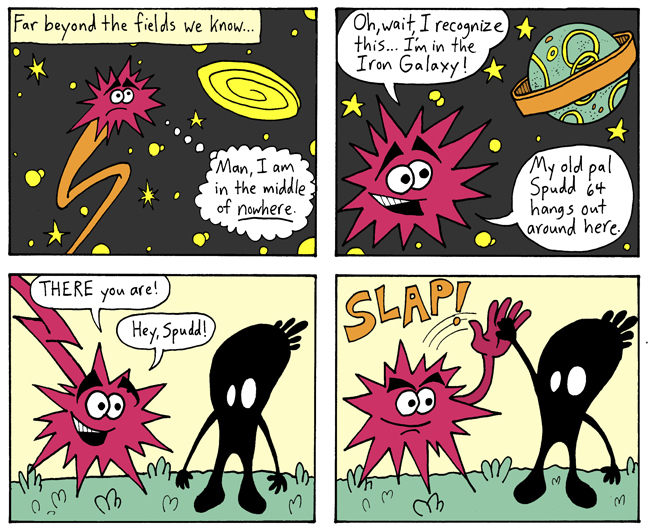 You may be wondering, "If he has to search through a whole galaxy, how does Space Blot find Spudd so quickly?" What you don't realize is that two years passed between panel 2 and panel 3. But that's not important! What's important is that this is a comics crossover event. Spudd 64 is the star of a series called SPUDD 64, which is about his adventures as he travels around the galaxy. It's written and drawn by legendary artist Matt Kish, it's beautiful, and it's one of my all-time favorite comic book series. I'm grateful that Matt gave me permission for Spudd to appear here. I also copied the planet in panel 2 off the cover of SPUDD 64 #4; it's not a rip-off, it's an homage. You can find the SPUDD 64 comics in the Matt Kish Archives. It will take some scrolling to find them, but you'll be scrolling through amazing artwork, so that's really more of a perk than a hindrance. Space Blot was created by me, back when I was 10. I've always liked him. He's fun to draw. Some of his highlights include his first modern appearance, his battle with Udanax, and that time he told Fuzzball about some of the planets he's visited. NEXT TIME: We check in on some other characters, as the Epilogue rolls on!